Founded and Managed by IYER BROTHERS (Ramnath & Gopinath) the Pichumani School of Carnatic Music, named after their Guru, specialises in the teaching of the ancient south indian instrument “the Veena” in Melbourne. It is said that each of the frets on the veena represents each disc of a human spinal cord. 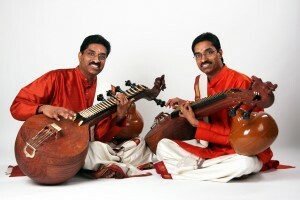 Melbourne-based twin brothers Ramnath Iyer and Gopinath Iyer are disciples of veena maestros Shri R. Pichumani and Trivandrum Shri R.Venkataraman. They have been undergoing rigorous advanced training from Shri. Venkataraman for the last eight years. Australia’s leading exponents of the veena, the Iyer Brothers have made a name for themselves in Australia and overseas as a unique duo in Carnatic (South Indian) classical music. Their music is both exciting and complex, beautiful and challenging. The brothers are ‘A’ graded artists of All India Radio, Chennai. Ramnath has been a resident of Melbourne since 1986. He has worked with visiting professional musicians from India, including the famous flute maestro Dr. N.Ramani. Ramnath has been serving as a peer specialist in Indian Music for the Australia Council since 1996. In 2002 Ramnath served as an adjudicator for veena at the third biennial Indian music competition held in Singapore by the National Arts Coucil of Singapore. Before immigrating to Australia in October 1993, Gopinath was a resident of New Zealand where he performed extensively. A few notable performances being Wellington Access Radio, Victoria University of Wellington and the NZ Academy of Bharatanatyam. He has participated with the renowned violin maestro Dr. L Subramaniam in a workshop during the Asia Pacific Festival in Wellington, in 1992. Since 1994, the brothers have been performing together and have been very well received in various centres around Australia and overseas, including the Four Winds Festival at Bermagui (1995), Australian Institute of Eastern Music in Sydney (1997, 1999), Port Fairy Folk Festival (1999), Womadelaide (2001), The Boite (1999 to 2007), SIFAS, Singapore (1998), ACT National Multicultural Festival in Canberra (1998), Australian National Folk Festival (2004) and their own performance projects which have been funded by Australia Council and Arts Victoria (1994, 1995, 1997) . The brothers have released a number of audiocassettes and CDs with the help of a grant from the Australia Council. Their latest CD titled ‘Soulful Strings’ was featured in ‘The Planet’ program of Australian Broadcasting Corporation’s Radio National channel. Since 1994, the brothers are annually featured in the December music festival in Chennai, India and have received rave reviews from the press. In 2003 the brothers were adjudged as the best veena artists in the junior category at the Music Academy (Lakshmi Sundaram award for Veena) and senior category at the Indian Fine Arts Society, Chennai. In 1990 the brothers established the Pichumani School of Carnatic Music in Melbourne and have been teaching the art of veena playing and vocal music. The school has grown considerably in the last decade with a dedicated group of about fifty students. They have also presented five of their senior students in full length solo veena recitals and two senior students in vocal recitals. The Ravindranath Tagore Cultural Association, by organising the veena duet by Ramnath and Gopinath, has strengthened its arts-patronage credo. Had you been listening from outside the auditorium without seeing the artistes, you would have been forgiven for thinking there was just the one veena being played-such was the perfect unison in which the brothers played. The experience of hearing a pair of veena-s in such perfect shruti and naada synchronism was a first for me. They began with a Varnam in Bhairavi followed by the Nattai obeisance to Mahaganapathi. ‘Aparadhamula-RasaaLi’ was an excellent selection. The splendid alapana to Muthuswami Dikshitar’s ‘HiraNmayeem Lakshmi’ had a profound effect on me, as did ‘Bhajarere’ in KalyaNi. The selection and execution of the main item of ‘O Rangashayee’ in Kambhoji was splendid. – Indian Link, March 2001. – Stephen Whittington, The Advertiser, Adelaide, Monday, February 19, 2001. – Australian Institute of Eastern Music, Newsletter, October 1996. – Shobha Sekhar, Indian Voice, July 1996. – Clive O’Connell, The Age, Melbourne, July 18, 1995. Im 30 years old and im interested to learn carnatic music . Would you mind giving me your time table and fees please . I have heard and read about your music school in Melbourne. I am very keen to get my daughter in. My daughter will be 3 yrs soon. I want to enquire about the right age to start her music lessons. I am keen to get her started at an early age for Carnatic vocal lessons. Once she is physically ready to hold the Veena, I also keen to start Veena lessons. Apologies if i posted my enquiry in the wrong forum. I could not find any other links for such enquiries. Much appreciate your response.